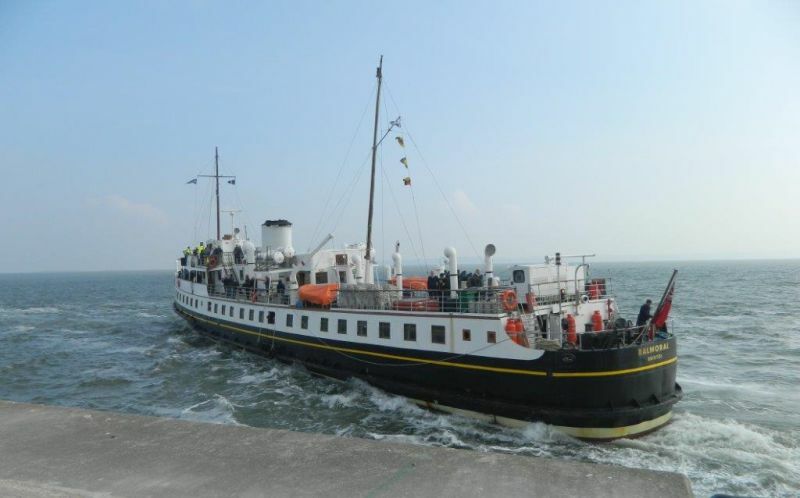 The 1949 built MV Balmoral made her third ever sailing from Mostyn on Thursday 10th September 2015, having arrived light ship the previous evening from Menai Bridge. Nearly 100 passengers set out from Mostyn in blustery conditions but by the time she arrived in Llandudno the sun was shining and a long queue of hopeful passengers was waiting to board – as they were again at Menai Bridge. By the time Balmoral went “under the bridges” there were over 400 on board. Unusually she had been through the Swellies at almost low water before turning off Plas Newydd and then coming out of the Straits for a cruise up to Moelfre, turning back to Llandudno where Mostyn passengers disembarked to return by coach. MV Balmoral first visited Mostyn on 28 May 2002. Since her last visit June 2007 she has had mixed fortunes and funds were not available for her to operate in 2013 and 2014. The Bristol-based vessel has now been returned to service under the ownership of a new charity MV Balmoral Fund Limited, with assistance from the Coastal Communities Fund, and is operated by their subsidiary White Funnel Limited.